The Divine Liturgy which celebrates and offers the Eucharist, is the grace and power of the kingdom, which are at work in the world. It is the supplier of the ‘essential food’, and weapon of our spiritual fight to live the gift of life according to God, in Jesus Christ. 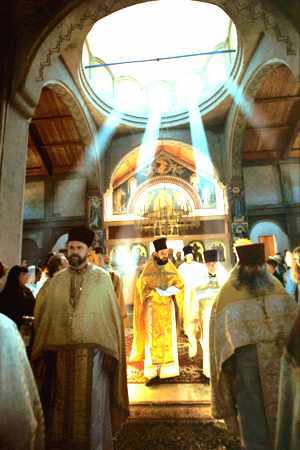 But, because the Divine Liturgy is the “Banquet of Christ”, the mystery and revelation of the Church, a festive, joyous, triumphant celebration of Life in Christ’s eternal life, the ancient discipline of the Church came to regard it as out of harmony with the penitential climate of Great Lent. 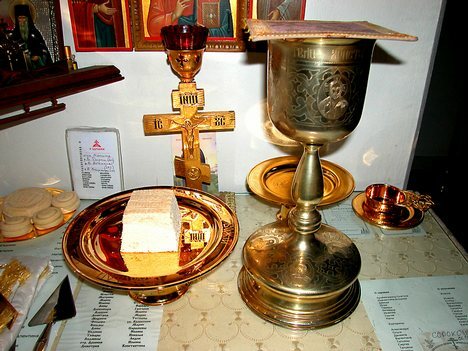 Yet to provide the faithful with the “food of immortality”, the Liturgy of the Presanctified Gifts, that is, with the Eucharistic Gifts consecrated beforehand at the Liturgy of the previous Sunday, came into use early on in Christian practises. WHY SERVE THE PRESANCTIFIED GIFTS? Its main service is to offer the faithful the heavenly manna that keeps us alive in our spiritual journey/pilgrimage, especially through the desert/fasting of Lent. Therefore it was attested as the approved custom by the Quinisext Council of 692. So, permeated as it is with the “bright sadness” of Lent, it has taken on a special beauty and solemnity. Of all the Lenten rules, this one is unique to Orthodoxy, and so gives us a key to our liturgical Orthodox spirit which forbids the celebration of the Divine Liturgy on weekdays in Lent. This is because the Divine Liturgy is incompatible with fasting, because the Eucharistic celebration is one continuous movement of festive joy, not sorrow. In early/ancient times, until the fourth century, Communion was considered so much a part of the Eucharistic Sacrifice/Liturgy that it was unthinkable to attend without partaking. For example, some of the faithful sometimes received the Sacrament more often than they attended the Liturgy, which was usually celebrated on Sunday only, the Lord’s Day, and this was by virtue of taking the Sacrament home with them, in a special ‘arca’ fashioned for this purpose. Fasting, consisted of the total abstinence from food and drink, at least from the early morning hours of the day, and trying to maintain good thoughts throughout the day. This approach is understood as a state of preparation and expectation, the state of spiritual concentration on that which is about to come. Physical hunger corresponds to the spiritual expectation of fulfilment, the opening up of the entire human being to the approaching joy. Thus, the Lenten fast is not only a fast of the members of the Church; it is the Church itself as fast, as expectation of Christ who comes to the Church in the Eucharist, who shall come in glory at the consummation of all time. WHEN IS THE PRESANCTIFIED LITURGY SERVED? As the years passed, the Christians unfortunately lost their original zeal and ignored the benefits from Holy Communion, and so they did not receive it every day or even every Sunday. They received it at long intervals. Therefore the Liturgy of Presanctified Gifts lost its original and main meaning to those celebrating it. 1. On Wednesday and Friday of the first six weeks of Lent. 2. On Thursday of the fourth week of Lent. 3. On Monday, Tuesday and Wednesday of Holy Week. The Sacrificial (or Resurrection) Liturgy is celebrated on all Saturdays and Sundays in Lent, on the Feast of the Annunciation, on whatever day it falls, and on Holy Thursday. (Good Friday is a liturgical day.) It is also likely that the Liturgy of the Presanctified Gifts was not always confined to Lent, but was common to all of the Church’s fasting seasons. HOW ARE THE PRESANCTIFIED GIFTS PREPARED BY THE PRIEST? On the preceding Sunday, at the Prothesis, after dedicating the principal Amnos, or “Lamb”, to be distributed in Holy Communion that day, the Priest prepares as many additional “Lambs” as there will be Liturgies of the Presanctified during that week, saying for each the same dedicatory prayers as for the first. However, at the Consecration of the Gifts, all the “Lambs” are presented as one, for Christ is One. Similarly, at the elevation, all the”Lambs” are elevated together. At the fraction, the Priest breaks only that Amnos which he dedicated first at the Prothesis. As for the others, he takes them one by one in his left hand, and with the spoon in his right pours a small amount of the Holy and Precious Blood of the Lord crosswise on the underside incised with the Cross, then places them in the tabernacle (a chest especially built to carry the Holy Lamb/ artophorion). On the actual Presanctified Liturgy on Wednesday and Friday, the Sacred Elements which were consecrated at the Divine Liturgy on Saturdays and Sundays, and preserved on the holy Altar in the tabernacle/artophorion, are moved by the priest who places the Gifts on the diskos with prayer and incensing after the Great Litany, during the chanting of the psalms (kathisma). He carries them in solemn procession around the back of the Altar, and to the Table of Oblation (Proskomide). The evening psalm, Lord, I have cried, is then sung with the special hymns for the day. This is followed with the evening entrance, the hymn O joyful light of the holy glory, and two Biblical readings; from Genesis and from Proverbs. From Genesis each year we learn all over again about the creation of the world, the fall of man, Cain and Abel, Noah and the Flood, God’s covenant with Abraham, Sodom and Gomorrah, Abraham being put to the test, and then about Joseph and his brothers. From Proverbs we are taught the practical wisdom for living the moral life. While always profitable for the believer these lessons date to the time when those preparing to be enlightened in Baptism, the catechumens, attended the Vespers part of this Liturgy. 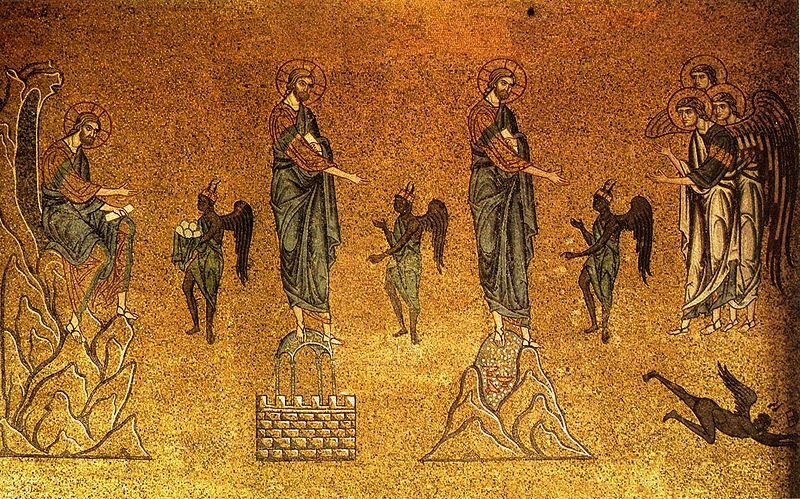 As we pray for the Catechumens (those being made ready for Holy Baptism on Easter Saturday), we sense a direct connection with the Christian Church of the early centuries, and understand the initial character of Lent as preparation for Baptism and for Easter. The Bible readings are punctuated by the Priest blessing the faithful with the censer and a lighted candle proclaiming The Light of Christ shines for all!. This blessing symbolises the light of Christ’s Resurrection, which illumines the Old Testament Scriptures and the entire life of mankind. 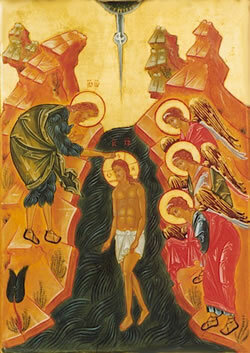 This is the very Light with which Christians are illuminated in the life of the Church through Holy Baptism. The Prayer of St Ephraim the Syrian, O Lord and Master of my life, (always chanted at the ninth hour during vespers) characterised by frequent prostrations, is read after the singing of the evening psalm, Let my prayer be directed like incense before you. O God, who are great and to be praised, who have brought us from corruption to incorruption by the life-giving death of your Christ, free all our senses from the death of the passions, setting over them as a good leader the thought that comes from within. Let the eye abstain from every evil sight, the hearing give no entrance to idle words, the tongue be cleansed of unfitting speech. Purify our lips, Lord, that praise you. Make our hands keep from base actions, to perform only such things as are well-pleasing to you, making all our limbs and our mind secure by your grace. Now the hosts of heaven invisibly worship with us; for see, the King of Glory enters. See, the perfected mystical sacrifice is being borne in. Alleluia x 3. O taste and see that the Lord is good. Alleluia, Alleluia, Alleluia. Christ Himself tells us about the ‘narrow way’ and the few that are capable of following it. Therefore, in this fight, our main help is precisely the Body and Blood of Christ, that ‘essential food’ which keeps us spiritually alive and, in spite of all the temptations and dangers, makes us Christ’s followers. Thus, having partaken of Holy Communion the communicants depart in peace with thanksgiving to God for His Coming. The special dismissal prayer asks God for a successful fulfilment of Lent and to worthily celebrate the Great Feast of Pascha – the Resurrection of Jesus Christ our Lord. Master almighty, who fashioned creation with wisdom and through your ineffable forethought and great goodness have brought us to these most holy days for the cleansing of souls and bodies, for mastery of the passions, for hope of resurrection; who through forty days entrusted to your servant Moses the Tables of the Law in letters divinely traced, grant us also, good Master, to fight the good fight, to finish the course of the fast, to keep the faith intact, to smash the heads of invisible serpents and without condemnation to reach and to worship your holy Resurrection. The Liturgy of the Presanctified Gifts is one of the great masterpieces of Orthodox Lenten worship and liturgical creativity. It reveals the central Christian doctrine and experience in its form and content; namely that our life must be spent in prayer and fasting in order to be in communion with Christ who will come like a thief in the night. It tells us that all of our life, and not only on fast periods, is completed with the Presence of the Victorious Christ who is Risen from the dead. It witnesses to the fact that Christ will come at the end of the ages to judge the living and the dead and to establish God’s Kingdom of which there will be no end. It tells us that we must be ready for His arrival, and to be found watching and serving; in order to be worthy to enter into the joy of the Lord. In this world we can only anticipate the glory and joy of the Kingdom, yet at Church we leave this world in spirit and meet at the Lord’s table where in the secret of our heart we contemplate His uncreated light and splendour. And each time, in anticipation, having tasted of the peace and joy of the Kingdom, we return into this world and find ourselves again on the long, narrow, and difficult road. From the feast we return to the life of fast, to preparation and waiting. But the Liturgy of the Presanctified Gifts offers us a unique taste of beauty and solemnity which make it the spiritual climax of Lenten worship, a light that illumines our path through this world. Anything that inspires us to become the change we want to see in the world is beautiful. That is what the liturgical rites want to offer us, the motivation to pray and to change at our own pace. I think its beautiful and prayer inspiring, as its a call of hope that we can foretaste heaven on earth as it is a reality and we are privilaged to experience it, by the grace of God. I was wondering if you could please pass along some info about the picture of the baptismal font — specifically where is this located? (and any additional info such as supposed date etc would also be appreciated) It looks Syrian to me, but I haven’t come across that one before. Any help is much appreciated. Feel free to email me privately if that is easier. peace. Paul went to Ephesus and wrote letters to the churches there. They are the Letters to the Ephesians in the New Testament. St. John, who is identified as the apostle, evangelist (author of the Fourth Gospel) and prophet (author of Revelation), worked and died in Ephesus. An incredibly large church was built over his grave by Emperor Justinian in the 6th century. This is the baptismal font from that church. 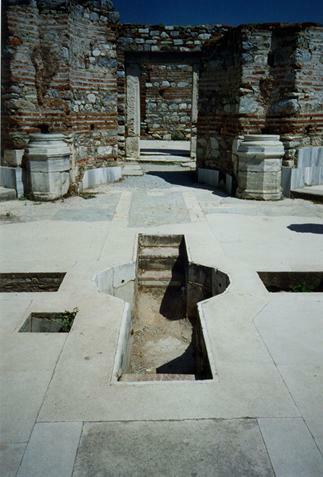 Therefore, it is believed to be St John’s Basilica in Ephesus from Christian Asia Minor, before it was occupied by Muslim Turkey in 1453. The basilica is on the slopes of Ayasoluk Hill near the center of Selçuk, just below the fortress and about 3.5 km (2 miles) from the centre of Ephesus.